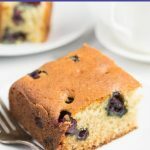 Gluten Free Blueberry Cake is the perfect breakfast cake, it’s easy to make and is nice and moist, not dry like some gluten free baking tends to be. 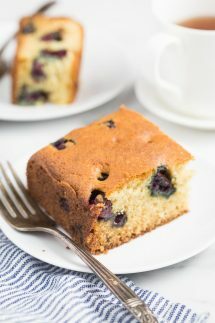 I like to make my gluten free blueberry cake and freeze some for later, it does keep for a few days in the fridge though. If you are dairy free I have some easy substitutions in the recipe for you as well. STEP 1 – Start by preheating your oven to 350F and while you’re waiting make sure that all your ingredients are at room temperature for best results. Measure the butter and sugar into a bowl and cream together with an electric mixer. While you can do it by hand with a whisk, if your butter it not really soft it might be a little tricky! STEP 2– beat the eggs then add vanilla extract, lemon juice, give it a good whisk and add it to the bowl with the butter and mix again. STEP 3 – In another bowl mix together the gluten free flour, xanthan gum, baking powder, and lemon zest so that it’s fully combined. 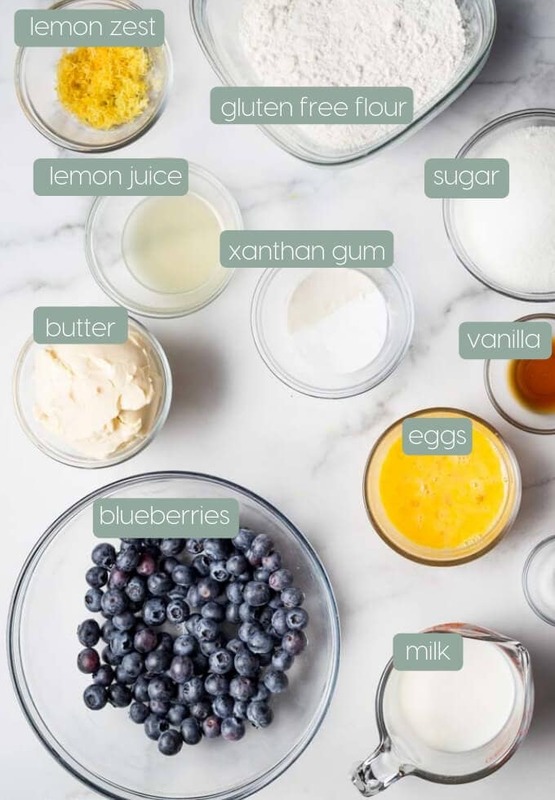 STEP 4 – Then add the flour mix into the butter/egg mixture and mix really well remembering to scrape down the sides of the bowl as you go so that the gluten free blueberry cake batter is properly mixed together. STEP 5 – carefully fold in the blueberries into the cake batter, do not be tempted to use a mixer or you will break the berries! 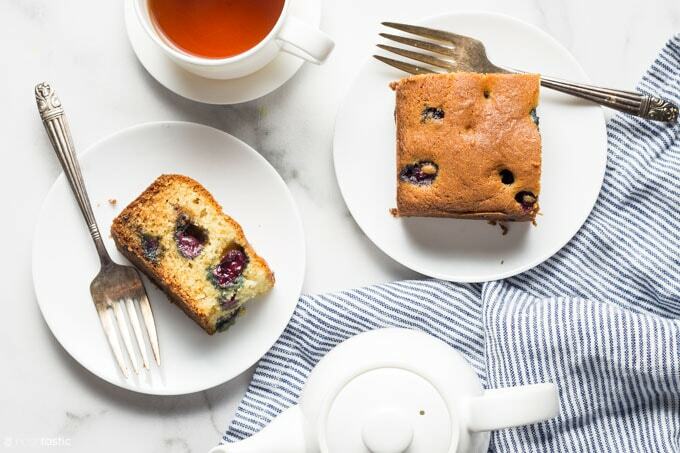 Pour the batter into a lined 9 inch square cake pan and bake on the middle shelf of your oven for 35-45 or until a toothpick comes out clean. Add beaten eggs, vanilla extract, and lemon juice to the bowl with the butter and mix again. In a separate bowl mix together the gluten free flour, xanthan gum, baking powder, and lemon zest. Add the gluten free flour mix to the bowl with the eggs mixture and mix again then add in the milk in small amounts until the cake batter fully combined. 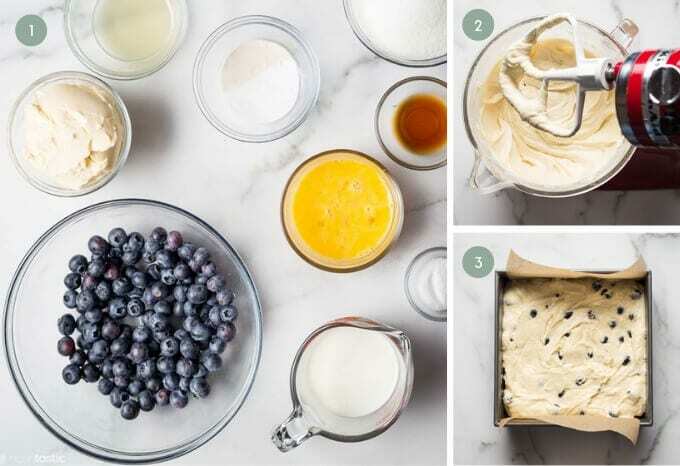 Add in the blueberries and fold in gently with a wooden spoon, don't use a mixer or you will break the berries. line a 9inch square baking pan with parchment paper on the base and grease the sides. Spread the batter evenly in the pan and sprinkle with a tablespoon of sugar on top. Bake on the center shelf of your preheated oven for 35 - 45 minutes or until fully cooked, check it with a toothpick in the middle to see if it comes out clean. I bake by weight and a digital kitchen scale which you can get one for only $10 - $15. It's more accurate for gluten free baking as different flour blends weigh differently, cup for cup. I prefer to use my own homemade gluten free flour blend as it's cheaper and I get really great results. For Dairy Free substitutes you can use Earth Balance vegan butter and a dairy free milk of your choice. Can I substitute the soy milk with almond milk? You sure can! I use unsweetened soy so if your almond milk is very sweet you may want to adjust the sugar in the cake a little, but that’s up to you. Is it possible to use frozen blueberries? Hi Marilyn, I’m not sure as I’ve only ever used fresh but I think it’s worth a try! I know it’s hard to be lactose free! I have a few recipes with cheese (mostly the dinners) but the almost all are dairy free or can be adapted to be dairy free. This cake looks so delicious! Can the amount of sugar be cut back without affecting the quality or is there an alternate substitute for the refined sugar? Thanks. Hi Sharon, I have not tested it with less, but I bet you could try it with a half cup and if you want to use coconut sugar (its not refined) I think that would work well. I just made this with a few alterations for allergy reasons. It smells spectacular! How do you cool it and serve it though? With the sugar on top it seems you would serve it right out of the baking dish, but it seems like the parchment paper in the bottom would cause issues when cutting and serving. Any help is appreciated. I’m sorry I didn’t see your comment until this morning. I usually let it cool in the pan then lift it out. Thank you! I left it to cool overnight in the pan. I needed it in the pan since we were taking it somewhere, so I turned it over onto a cookie sheet, peeled off the parchment paper, and then flipped it back into the pan. It worked pretty well. It tasted very good. I need to tweak my vegan/allergy friendly version a little more, but definitely trying this one again. Thanks! Not sure what I am doing wrong, but every gluten free cake I try is way too dry! Hi Laura, I’m so sorry that’s been your experience, I’d love to help troubleshoot if I can. What flour blend are you using? That may be the root of the problem. I just figured out all the problems I am having are not only dairy, but gluten as well. It’s been a battle! I’ve lost 70 pounds and struggled with diarrhea and vomiting! It’s been a nightmare! After a few visits to a specialist, and a number of tests I wondered what the heck CAN I eat? It’s been quite a whirlwind! I believe you are right on, as I had no idea about a blend with gluten free! Now I simply have to figure out what kinds of blends I need to make this work! I’ve been reading everything I can get my hands on and everywhere I can throw in front of my eyes! I’m just not sure how much of what for this blend to be! I do have a gluten free flour, but have taken your suggestion of pillsbury and it’ll be here tomorrow! I have gotten xanthan gum and have liquid and more solid coconut oils! From what I’m seeing, coconut oils and olive oils tend to be in more gluten free recipes than other oils. Thank you Sheena for taking this time with me! You have no idea how thankful I am for being able to write to you and you write to me! You are truly a blessing! Hi Laura, please feel free to email me (my contact email is at the top of the page under the contact tab) with gluten free baking questions anytime and I’d be delighted to help if I can. It can be challenging at first but you’ll get used to it I’m sure! Yes, you can just use another kind of milk you prefer. Can you tell me what is in your GF flour mix ? Hi Shirley, the link to my gluten free flour recipe is in the recipe notes above. I vary my blend depending on what flours I find in the store, but you can read all the details in that post, I hope that helps.